Two Megastars of the Indian film industry have bumped into each other very recently. They are none other than Megastar of South Chiranjeevi and Megastar of North Aamir Khan. The actors who were holidaying in Japan happened to meet each other at Kyoto airport. All the mega fans are overjoyed to see such huge stars in one picture. 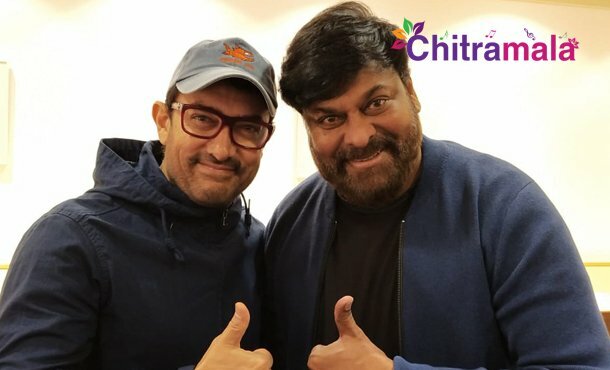 Interestingly, Chiru revealed about his ongoing project Sye Raa Narasimha Reddy to Aamir and is said to have requested him to do a special cameo but Aamir is said to have politely declined the request saying that the movie already had a huge Star cast including Big B Amitabh and added that the movie doesn’t need him. He also wished the actor best for the movie.